Adel Church was the setting on Friday 22 and Saturday 23 June 2012, for a very special drama staged to celebrate both the Queen's Diamond Jubilee and the official birthday of the Church's Patron Saint, St John the Baptist. It was based on incidents from the known history of Adel. The chief guest of honour was local resident, Mr Gordon Tollefsen, a Deputy Lord Lieutenant of Yorkshire, who looked resplendent in his uniform and who replied on behalf of Her Majesty to the welcome given by the Rector, Dr Ian White. The evening started with Margaret Steel playing country airs on the organ to 'put us in the mood'. This was reinforced by the first song, sang by all, to the tune 'Scarborough Fair', with words by Pat Riley. Pat co-authored the play which was her brain-child. Then a team of four narrators from Adel St. John's School (Tom Elton, Oscar Jackson, Bethany Kramers and Rhianna Moore) came on stage with their teacher, Karen Baylis, and set the scene. 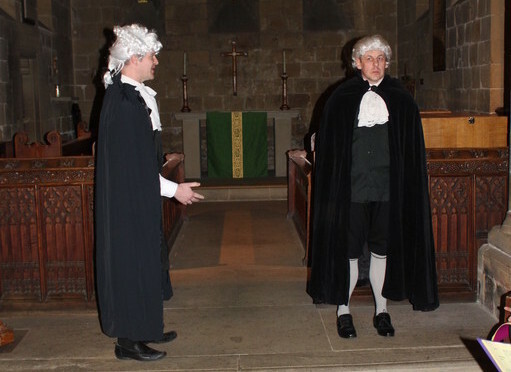 It was not long before we were witnessing an extremely moving trial scene, in which a butcher (David Cardus), who had fallen on hard times, resorted to stealing sheep from a friend and wealthy neighbour, Samuel Hainsworth (Owen Carey Jones) of Adel Mill. The sheep-stealer's guilt was easy to prove - the hoof marks were followed to his premises where the fleeces marked with Hainsworth's mark were found. 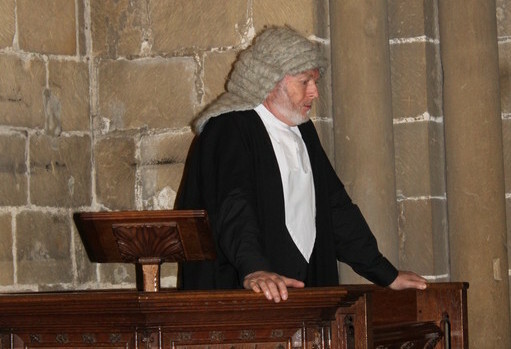 He was sentenced to death by the judge (Alan Foale) - the normal punishment for such an offence, despite a plea for mercy eloquently made by the foreman of the jury, Earl Pollington (Geoff Steel) - but we learned it was latter commuted to a term of imprisonment. Adding authenticity were the two constables (Allan & Charlie Dawson). The script and the Adel Players (& friends!) made this into a really dramatic scene, which brought home those harsh times - something emphasised by having representatives of the 'next generation' in front of us. It was rounded off by Pat Riley singing an historic English folk song - the poignant 'Gaol Song' - with the audience joining in the chorus. The next scene too reinforced Adel's rural past - this time telling the story of Thomas Kirke, of Cookridge Hall, a local land-owner. His name lives on in a blue plaque on the Hall, in the beautiful window he donated to the Church, now in the vestry, and in the benefaction he left to the poor of Adel - now mainly channelled towards the young of Adel. 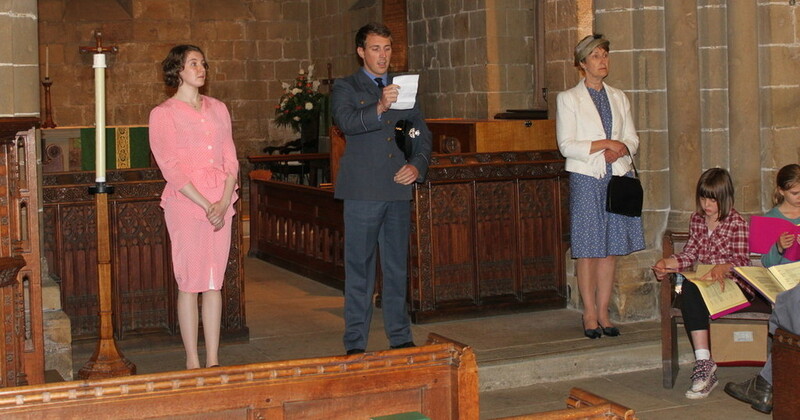 This section started with us singing a hymn known to Kirke - Tallis's Canon. 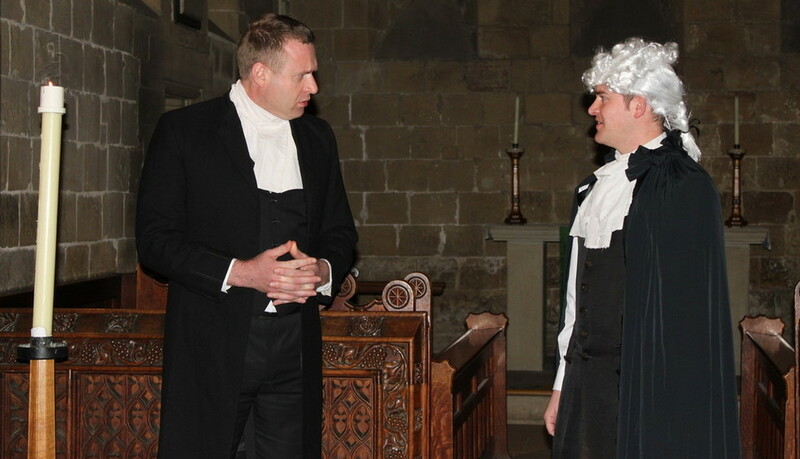 The scene showed Miles Gale, Rector of Keighley (Andy Sneddon), who had been his tutor, visiting Adel Church after Evensong to pray for the soul of Thomas. As the lights dimmed, the ghost of Thomas Kirke (acted by Jon Holmes) appeared to Miles, and then later the 'real ghost' that haunts the church (Rob Colbeck) appeared seemingly from nowhere and surprised us all! Then we moved forward a couple of centuries to the life of Isabella Ford, of Adel Grange, a quite extraordinary, highly educated young woman with a flair for languages. She worked tirelessly to try to achieve a fairer society for all. She was from a progressive Quaker family and her first move into the political arena was as champion of the working class tailoresses, helping found a trade union for them. She also became a leading Suffragist - urging votes for women, but not willing to use or condone the violence used by the Suffragettes. She was a founding member of the Independent Labour Party (they dropped the Independent later) and travelled widely as a speaker both in Britain and the Continent. I think this was my favourite section. 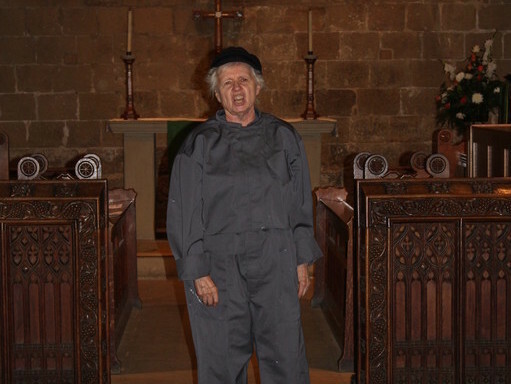 Kay Yates sang the historic folk song 'Poverty Knock' with the audience joining for the chorus. Her voice was magical. 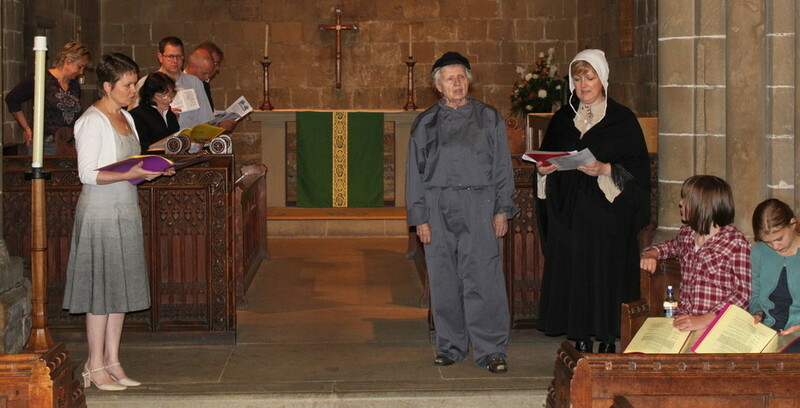 Then Isabella (Cal Rake) appeared, accompanied by a weaver and a home-sewing worker (Lesley Walton & Alison Howarth). I was just mesmerised - it was as if Isabella had sprung to life with two of the poor, hard-working women that she helped. Strong writing, brilliant acting - it was truly superb. Another historic folk song, 'The Factory Bell', was then sung, again by Kay Yates. This was a hard act to follow, but it was - with the final tale being that of Pilot Officer Alec Bird (Chris Andrews), who met his death intercepting a German bomber on a mission to destroy the Gloster Aircraft Factory at Brockworth. His widow and mother visited his grave in Adel Churchyard, years later and met with Val Crompton, one of the co-authors. 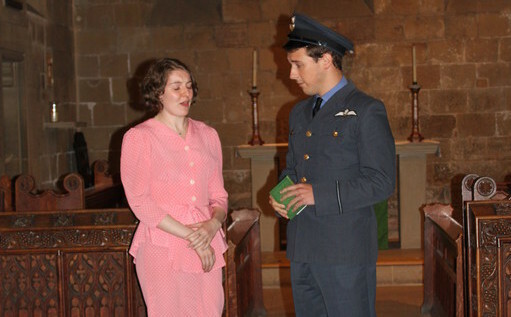 It seems that Alec had a premonition of his death, but that his wife and his mother (played by Helen Duce and Anne Andrews), whilst obviously heart-broken, realised that flying was his life and that he died doing what he loved, for his country. Although a sad tale, it did not leave the audience too down-hearted. 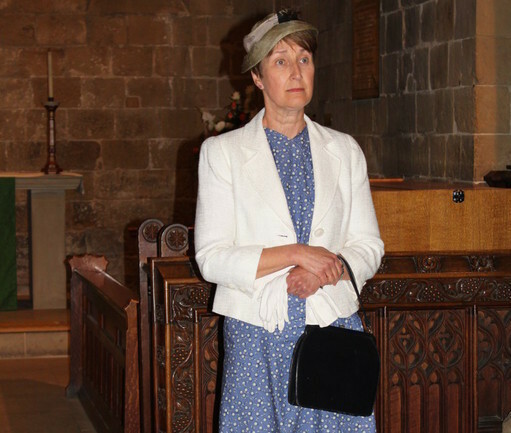 It had been a superb evening of storytelling and song which was rounded off by refreshments at the Stables - a mammoth catering task as the Church had been packed. People chatted, caught up with each other, and looked at the information boards with more illustrations of the history of the area. Adel is lucky to have a store of wonderful stories in its history and a vibrant and warm community to share them with. The feedback on this production, directed by Mike Andrews, has been uniformly enthusiastic. Maybe we can look forward to something similar for the commemoration of WW1 - 2014-2018?